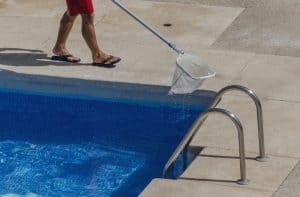 Stainless Steel Pool Equipment’s | H & H Commercial Services, Inc. Stainless Steel Pool Equipment’s | H & H Commercial Services, Inc. Stainless steel is a popular choice in indoor pool environments for a number of reasons. Providing a sleek look, easy care, and corrosion resistance, it lends natatorium structures and furnishings superior strength and durability. Capable of retaining its beauty and structural integrity well-beyond 25-years of service, commercial HVAC mechanical contractors in Philadelphia still see stainless steel natatorium components taken out of service before their time however, due to inadequate design and use of indoor pool dehumidification systems. Are your components at risk? Today’s indoor pool environment has changed since the 70s, trending toward higher water temperatures, a larger number of bathers, the addition of water features such as splash pads, fountains, and slides, and the need for higher levels of chemical disinfectants. Unfortunately, this aggressive indoor environment can wreak havoc with stainless steel structural components and equipment, quickly causing corrosion when inadequate ventilation and excessive pool room humidity control come into play. What’s Ailing the Air (& Stainless Steel Components) in Your Pool Room? Pool dehumidification experts know, chlorine-based chemicals, relied upon to disinfect pool water, chemically react with nitrogen-bearing compounds such as urea found in sweat and urine. This creates volatile chloramines which are released into the natatorium atmosphere where, without adequate ventilation (a choice made out of ignorance or the desire to decrease energy expenditures), they are increasingly deposited, forming a buildup on metal surfaces. Combined with evaporation and condensation cycles, a corrosive solution is created that takes a toll on stainless steel components. This calamitous chemical cocktail, exacerbated by lackluster ventilation and poor pool room humidity control, is at the heart of most metal corrosion problems found in indoor swimming pool environments. Structural load-bearing or highly cold-worked stainless steel components above pool level are at the greatest risk of corrosion. This includes deck-level components, elevated balconies, and especially those components located out of reach near the ceiling (ductwork, ceiling components, balconies) where high levels of chloramines may be deposited. In these areas, a lack of cleaning/rinsing takes a toll. Unlike components located at pool level in areas frequently splashed or immersed, these elevated areas never undergo the regular indirect ‘cleanings’ to rinse and remove the chloramine cocktail that can cause corrosion. Ensuring proper ventilation and humidity control with the addition of a carefully designed pool room dehumidification system, such as a Dectron pool dehumidifier, help keep atmospheric moisture levels and the buildup of airborne chlorine, chloramines, and other chemicals under control, curtailing the aggressive conditions that can result in the deterioration of stainless steel and other alloys. This also reduces costly stainless steel maintenance and replacement needs, helping your pool room and equipment maintain an attractive appearance and safeguarding its lifespan. Ensure a natatorium that’s designed to withstand the tests of time with the help of the best commercial HVAC company in NJ. Schedule a complimentary indoor pool dehumidification system design consultation and quote with the pool room dehumidification experts at H&H Commercial Services. ← What Will Happen To Commercial HVAC Upgrade Incentives For The 2019 Year?